The technology expansion EtherCAT G takes the high EtherCAT performance to the next level by delivering the Gbit Ethernet speeds needed to support highly data intensive applications. The latest technology expansion is compatible with the globally established 100 Mbps EtherCAT standard, and also provides the same familiar ease of use. The new branch controller model for EtherCAT G also enables efficient operation of multiple network segments in parallel. 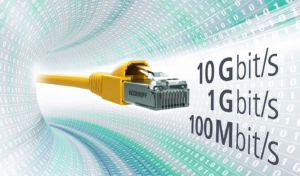 EtherCAT G supports standard Ethernet transmission rates of 1 Gbps; its EtherCAT G10 counterpart, already introduced as a proof-of-concept technology study, is even faster with data rates of 10 Gbps. The sharp increase in transmission rates beyond EtherCAT’s 100 Mbps significantly increases the possible data throughput. With propagation delay times through devices as a limiting factor on the one hand, but boosted by the newly introduced branch model on the other, EtherCAT G can deliver a two-to-sevenfold performance increase, depending on the application. EtherCAT G and G10 are not meant to replace the highly successful EtherCAT standard based on 100 Mbps Ethernet. The new performance levels are intended as system-compatible expansions.